Internet Business: Commerce and Tax is the second edition of the well received e-commerce: law, business and tax planning. In the ten years which have passed since the first edition was published and the dotcom bubble burst, tax has been a constant issue for all internet based businesses and transactions. This book examines the direct tax and VAT issues relevant to all the important areas of internet business. We are now witnessing a spectacular explosion of internet based businesses. Retailers are having to adapt to the opportunities and challenges of the marketplace, by creating and protecting a presence on the global market, and meeting the demands of supplying goods and services within an international market. This not only mark a radical transformation within our society, but also how we advise internet businesses. 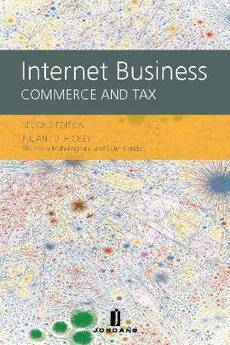 This book provides a much-needed overview of the main tax issues that are involved in carrying on internet business.